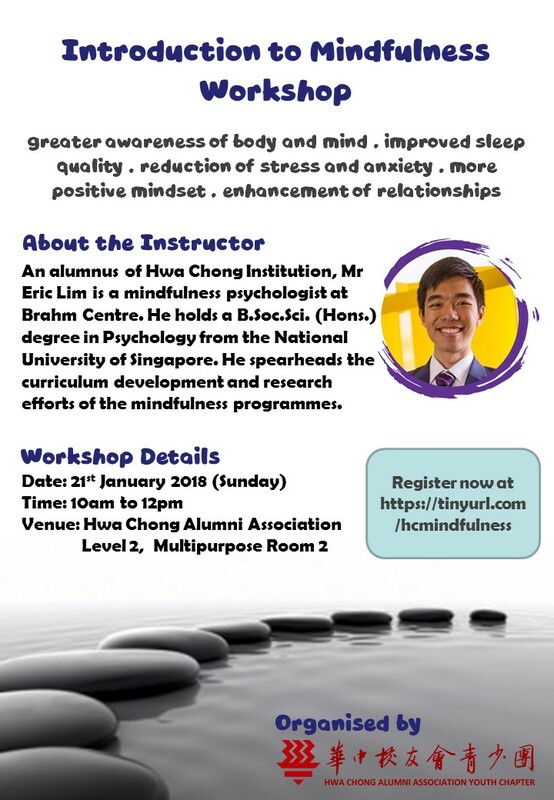 You are cordially invited to participate in the Introduction to Mindfulness Workshop organised by the Hwa Chong Alumni Association Youth Chapter. This introductory mindfulness course is designed for anyone who wants to have an understanding of mindfulness, and start to apply mindfulness in their daily lives and enjoy the benefits. We have invited our very own alumnus and experienced psychologist, Mr Eric Lim to conduct this introductory workshop. This workshop is free for all Hwa Chong alumni, students and their parents. 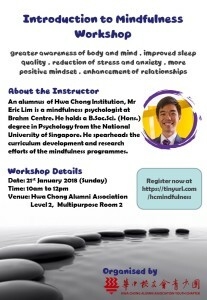 An alumnus of Hwa Chong Institution, Mr Eric Lim is a mindfulness psychologist at Brahm Centre. He holds a B.Soc.Sci. (Hons.) degree in psychology from the National University of Singapore. He spearheads the curriculum development and research efforts of the mindfulness programmes. He is a certified .b and Paws b teacher from the Mindfulness in Schools Project (UK), and conducts both courses for children and youths at Brahm Centre as well as in schools. He is a qualified Mindfulness-Based Stress Reduction (MBSR) teacher from the Centre For Mindfulness (CFM) University of Massachusetts Medical School. He has worked with children, youths, parents, adults and caregivers in conducting mindfulness talks and workshops for organisations such as National University of Singapore, Taman Jurong Community Club, Hwa Chong Institution, Nanyang Girls High School, Singapore Management University, Nanyang Polytechnic, Yishun Town Secondary, St Anthony’s Canossian Secondary, Ai Tong Primary, Asian Civilization Museum, MacPherson Community Club, Whispering Hearts Family Service Centre and Ren Ci Hospital. As seats are limited, sign up soon!